What Should A Daily Natural Skin Care Routine Consist Of? If you are wondering about what a daily natural skin care routine consists of, here you can find all the steps that can lead you to a prettier and healthier looking skin away from harmful skin care ingredients. When the skin is not properly cleansed, pores get clogged and this can lead to breakouts. A clogged skin also means that the skin care products you are using cannot fully get absorbed, therefore they are not able to work as they are supposed to and give you the benefits you seek from them. Cleansing twice a day removes all harmful bacteria and toxins that gather on your skin. In a natural skin care routine though, you have to pick up carefully a cleanser according to your skin’s type and the ingredients of the product. A natural cleanser or a cleanser that is organically certified is a good choice. But beware! Not all products which are named natural are in fact completely safe. A lot of them contain harmful substances which can irritate and harm your skin in the long run. 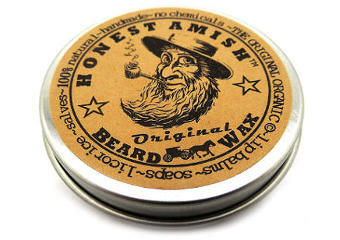 Always check for organic certifications and read user reviews to determine whether a product is what it claims to be. Pai’s Camelia & Rose Hydrating Cleanser is an awarded certified organic cleanser suitable for all types of skin including sensitive skin. When you find the right natural cleanser, keep in mind that over cleansing is not recommended because it can destroy your skin’s natural moist. Neither oiliness nor dryness is good for your complexion. In case of a combination or oily skin, cleansing should balance it and prevent blemishes while in dry skin, cleansing shouldn’t strip off your skin’s natural oils which can make it more prone to signs of aging. A natural skin care routine for combination skin but also for dry skin should consist of cleansing which is done using high quality moisturizing and cleansing ingredients that are suitable for those types of skin. When you have make up on always remove it before going to sleep. Did you know that jojoba oil can be used as an excellent make up remover? Well, in my case of prone to blemishes skin, this natural oil removes dirt, balances my skin and prevents the appearance of breakouts. Avoid soaps because they can dry up your skin and synthetic cleansers which can trigger a number of skin ailments such as rosacea, eczema, uricaria, contact dermatitis and even adult acne. Especially if you have a sensitive skin carefully select the best cleanser for your skin type and condition. This is one area of skincare that a lot of people tend to neglect. However, exfoliating is very important and if you do start exfoliating, you should notice a difference in the clarity and radiance of your complexion quite quickly. By exfoliating, you remove the dead cells so that your skin can absorb all the beneficial ingredients that will follow from the application of your moisturizer. You do not need to exfoliate every day of course and in fact, once or twice every seven days can be sufficient. A gentle but yet effective natural exfoliator can help you clear the pores and balance your skin in a safe, effective and beneficial way. 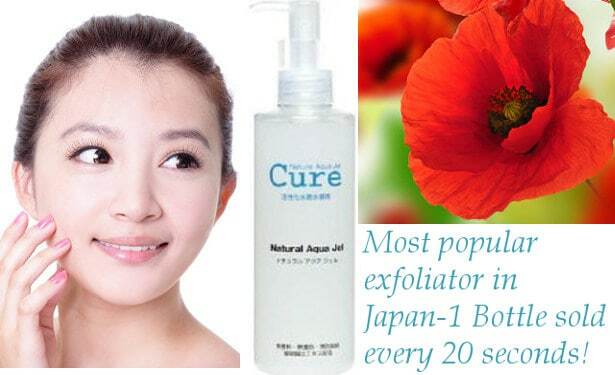 Cure Natural Aqua Gel is the number 1 selling skin care product in Japan with one bottle being sold every 20 seconds. Now, if you have a sensitive skin, you do not need to avoid exfoliating. Just choose an organic facial scrub for sensitive skin. Another very important step in a daily natural skin care routine is moisturizing. Our skin needs specific elements to stay healthy looking, elastic and more resistant to aging, so a proper natural moisturizer always works towards that purpose. Choose your moisturizer according to your skin’s type, age, skin condition and of course its ingredients. After a certain age which is usually after 30, you can go for a natural night cream, too. Men´s natural moisturizers are especially designed to suit men’s skin although there are a lot of skincare products that can be used by both men and women like Yalmeh Aloe Vera Face Moisturizer which is a good quality moisturizing and anti aging natural product very positively reviewed by both women and men. Avoid doubtful synthetic ingredients which can dry up your skin and age it faster and go for the more natural ones which can boost your skin’s own ability to stay young and elastic. A moisturizer should be applied in the mornings after you have cleansed your skin as well as night. After applying it, you can use a natural facial oil of your preference which can nourish, condition and boost your skin’s collagen during the night, providing you with a softer, more glowing complexion the next day. Still, facial oils can also be used during the day. Using a natural toner is a good way to hydrate and re balance your skin before applying your moisturizer. For a sensitive skin, be careful that the product you choose is free from alcohol and harmful synthetics. Keep your skin softer, more elastic and nourished. Rosehip Oil is a highly recommended choice. Help your skin become more resistant to aging. 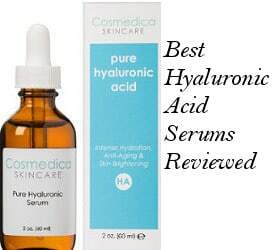 Vitamin C serums as well as hyaluronic acid serums are reviewed excellent by users as to the prevention and elimination or reduction of fine lines and wrinkles. Help you get a more clear skin. For example, Jojoba oil and Coconut oil are excellent acne oils. Give your skin daily protection from all kinds of skin deteriorating conditions such as weather, extreme heat or cold and pollution. For me personally, and I guess for a big number of men and women, eyes appearance is a sensitive issue because signs of aging can really show in this area. Wrinkles, fine lines, crow’s feet, droopy eyelids, bags under eyes, dark circles are some of the conditions that steal from our eyes beauty. Eyeliss and Haloxyl are some of the ingredients contained in eye creams that are clinically proven to fight puffiness, dark circles and wrinkles. Choosing an effective eye cream with good quality natural ingredients, which are going to treat this area gently, is always needed to make our eyes look beautiful and refreshed. For an easy solution to relax tired eyes and diminish puffiness you can also read my aloe vera recipes for skin which you can prepare on your own quickly and easily. Sun’s benefits are important for your general health but sun protection is a vital part of a daily skincare routine. Unfortunately, the sun can dry your skin and lead to faster aging. It can also damage it up to a great extent if you sunbathe extensively and if you do not use a sunscreen. So, always remember to apply a moisturizer with SPF and avoid prolonged sun exposure. At points when our complexion looks dull and dehydrated, moisturizing facial masks can bring it back to life quickly and effectively. Cleansing masks can also be used for the purpose of deeper cleansing and unclogging the pores. 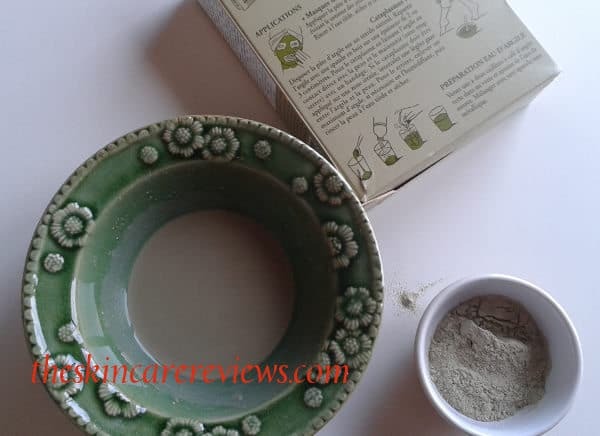 One of my favorites is French green clay mask. Facial masks can be used once a week or whenever you feel that you need an extra help either relating to hydrating or cleansing. Probably the most unknown but one of the most effective parts of an everyday natural skincare routine revolves around the health of our body…on the inside. Many of us spend all of our time trying to take care of our skin, without realizing that the job would be 10 times easier if we looked after ourselves internally. Did you know that if our body is lacking in nutrients, our skin can become dry, be more prone to blemishes and even cause wrinkles down the line? But which are those vitamins that are important for a healthy looking glowing skin? Vitamin A is tremendously good since it helps to clear out free radicals, repairs any damage that has been caused and restores dry skin. This results in a healthier, younger and softer skin, both to the feel and to the look. If we are lacking in this vitamin, we could suffer with dry as well as irritable skin. This vitamin also harbours excellent anti-inflammatory benefits which help to reduce any itchiness or irritation. 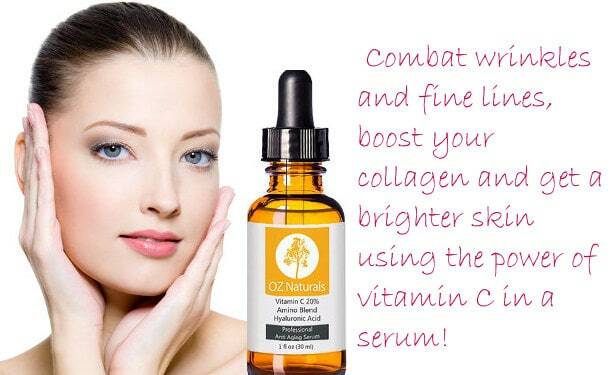 Vitamin C boost collagen’s production which is so important for our skin’s staying elastic and more youthful. Adequate amounts of vitamin C can also help us deal with signs of aging in an effective way. 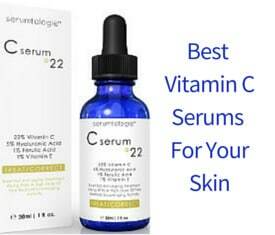 Vitamin C serums are perfect for that purpose. A “natural sun cream” in many ways, vitamin E can protect us from the ultra violet rays of the sun. It is also a powerful anti-oxidant. Vitamin C together with Vitamin E make a powerful anti aging combination. But it is not just vitamins that are good in a natural skincare routine. Minerals such as selenium and zinc are both excellent natural sun blocks whilst zinc can also heal our skin and repair our skin cells. Fatty acids also play a strong role in maintaining our skin, with the more common ones to be found in omega 3s. In conclusion, these were the steps you will need to follow in a daily natural skin care routine apart from exfoliating and applying facial masks of course which you won’t need to do every day. Also, remember that the best natural skin care routine is the one that suits your skin’s type and needs in a safe and effective way.